As an Audubon member, you play a critical role in protecting birds, wildlife and the natural resources found in Rhode Island. You'll also receive free admission to the Audubon Nature Center and Aquarium, discounts on programs, camps and rentals, invitations to member-only events, discounts at the Nature Gift Shops, and special member communications and email updates. 2018 marks the centennial of the Migratory Bird Act, the most powerful and important bird-protection law ever passed, and one that is being threatened. In honor of this milestone, the Audubon Society of Rhode Island joins National Geographic, the National Audubon Society, the Cornell Lab of Ornithology, BirdLife International and more than 100 other organizations around the world to celebrate 2018 as the "Year of the Bird." We are working to raise the visibility of birds and awareness about the challenges that birds are facing and what people can do to help. Climate change is a threat to the survival of more than half of the birds in North America. Over 300 species are on the brink. 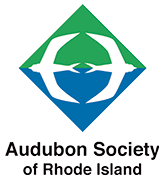 From conservation, legislation, advocacy and education, the Audubon Society of Rhode Island is helping to protect birds and their habitats - join our mission today at half-off! Birds are cool. You can save them. Alongside hundreds of people and organizations who love birds, we celebrate 2018 as the #Yearofthebird. The most followed independent Audubon page in New England! Share your bird photos on our community page. "It's what's happening" in the #RIAudubon world. Share your photos using #RIAudubon for a chance to be featured on our page. Sign up to receive eWing, our twice-monthly newsletter. We'll fill you in on fun RI natural history stories, Audubon news, events and programs, as well as actions you can take to help protect our birds and environment.